Everyone has heard of Roald Dahl’s classical book Charlie and the Chocolate Factory. But people may not know that composer Peter Ash and librettist Donald Sturrock took this iconic story, and turned it into a larger-than-life opera. The Atlanta Opera is excited to bring The Golden Ticket to our stage this March. 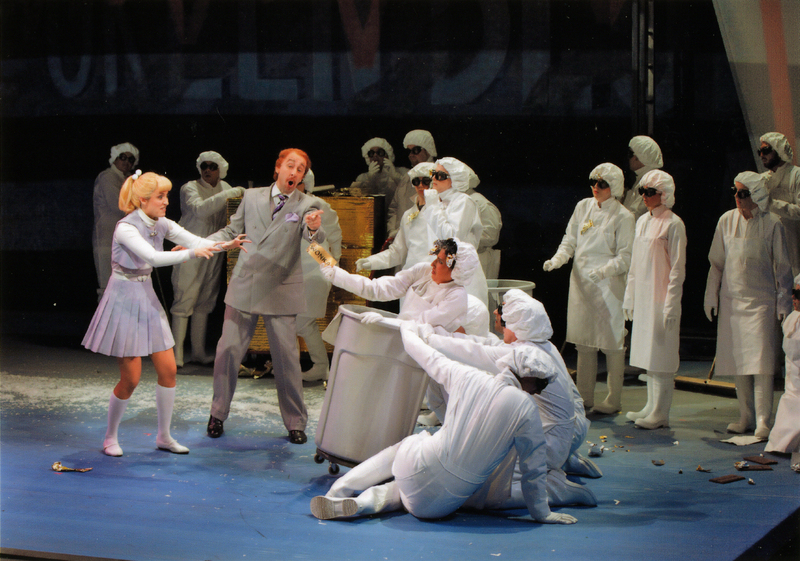 If you love chocolate, beautiful music, and Oompa Loompas, this opera is for you. 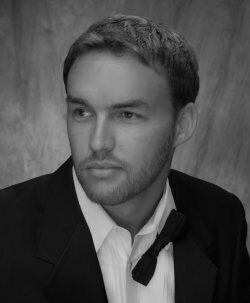 To give readers an inside scoop on what being a part of this innovative opera is like, this week’s blog features a Q&A with baritone Adam Cannedy. Adam has been in the past two productions of The Golden Ticket, once in the world premiere with the Opera Theatre of Saint Louis in June 2010, and later at the Wexford Festival Opera in October of 2010. 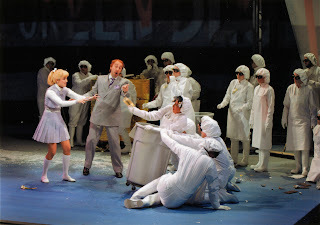 As someone who has a great deal of personal experience with this opera, Adam shares why working with Peter Ash was exciting, and yet intimidating, and why creating the characterizations of the first “big” Oompa Loompas is something he’ll never forget. Enjoy! 1. What was it like being a part of the world premiere of The Golden Ticket? Working on the world premiere of The Golden Ticket was rewarding and daunting at the same time. When I received the score, all we had to reference was an electronic sampling of the music, which really meant we were starting from a blank pallet. I remember working on the music for hours in the practice room trying to figure out where I would find the notes, how the harmonies fit together, etc. It took a lot of time, but it was worth it. This wasn’t my first premiere, and with any premiere performance, it is great to feel like you are putting your stamp on something that will hopefully be performed for many years to come. 2. How was it different performing in an opera with a living composer? Did you enjoy working with Peter Ash? I have worked with several living composers, and it is always such a thrilling experience for me. Working with the composer really raises the stakes. I had the great pleasure of working with Peter on Wonka’s music, and coaching Wonka’s Welcome aria. It is such a rare experience to have the person responsible for putting the music on the page say, “Now, Adam, I wrote that as a sixteenth note, and you sang an eighth note. I want you to enjoy the rest, and let the silence speak!” Talk about accountability! You have this opportunity to ask questions and feel confident that your performance is an honest representation of what the composer wants. Peter is wonderful to work with, and his vision for this opera is clear and inspiring. 3. How was portraying such iconic characters as the Oompa Loompas? Ah, the Oompa Loompas. In every representation of this story to date, there is one constant: the Oompas are little people. This is simply not possible for the opera stage. The music for the Oompa Loompas is some of the most interesting and difficult music in the score, so you just can’t have a children’s chorus running around as these characters. They are too important. So we found ourselves, fully-grown adult men, being thrust into the world of the Oompas… and it was awesome. What is really exciting about being the first “big” Loompas ever was we got to create the characters. The characterization of the Oompas that the Atlanta audience will see started with us in St. Louis. We knew audiences would expect little people, so we countered that expectation by creating a sort of in-human and weird character in the Oompa Loompas. The way they walk, the way they laugh, the way they interact with other characters: the audience will no longer feel like they are watching human adults. It was a lot of work, but some of the most fun I’ve ever had on stage… the sky was the limit. We all had the motto that “the weirder, the better,” and that really seemed to work in translating these characters to the opera stage. 4. Musically speaking, what do you like about the composition? How does this opera translate the things we love from Roald Dahl’s classic story into music? It had been years since I read the book Charlie and the Chocolate Factory, so I bought a new copy to research this opera. For anyone unfamiliar with the original story, it is filled with strange and bizarre scenarios and characters. Peter did a fantastic job putting these unexpected oddities in human behaviors into a musical score. The story really delves into the world of human behavior, focusing a lot on the horrible bratty behavior of four of the five children in the story. What I really love about this score is the way Peter references other eras in operatic composition. For example, to have the gluttonous child, Augustus Gloop, sung as a tenor who milks every high note was a genius move. Also, the gum-chewing, mile-a-minute girl who never seems to stop talking, Violet Beauregard, is a coloratura soprano, with moving notes that never seem to stop in speed or range. It could very well be a Handel aria, and it’s amazing to hear anyone sing some of the stuff he’s written. I think the audience will really love seeing and hearing these characters portrayed as singers. And Charlie, he’s the only character who is actually a boy – a boy soprano in fact. It really adds to the purity of that sweet character that he is the only actual child on stage. But of course, my favorite music is that of the Oompa Loompas. Peter created their music as a sort of Vaudeville interjection of commentary on the behavior of these kids that the audience is witnessing on stage. It is the Oompa Loompas who end up teaching the lesson as each child meets his or her demise throughout the factory tour, and their music is just the best. 5. What do you want audiences to take away from this opera? What I really want the audience to take away from performances of The Golden Ticket is the lesson at hand. We see such exaggerated versions of really heinous behavior by these children and their parents, but by the end of the opera, the audience is rewarded to see that Charlie, the real hero of the story, wins in the end. His life is made better because he is GOOD. From a musical perspective, I hope the audience will discover something new about opera. To this day, people who don’t know much about opera are surprised to learn that there are operas that exist in English. People still assume that opera is about the “fat lady” and Italian plots no one understands…but there is so much more to opera! This opera is so accessible. It is a story people know in our own language, and I hope that it will open people’s eyes to the vast world of music and story that opera has to offer. In the end, I hope it will create a whole new age of opera fans. 6. What are some of your favorite memories from past performances of The Golden Ticket? Really, my favorite memories were experiencing something new during each and every performance. There were no rules to how this opera should be performed, so with each performance, we [tried to] create something special. During the initial run, I don’t think the Oompa Loompas had two performances that were alike. Each night we found a new way to be weird and crazy, and it was a blast. The best memory I have is getting nine guys together on stage to see who could be the weirdest. How often do you get to do that? Our first time in costume, we transformed. All of a sudden, it wasn’t Adam, Jonathan, and Adrian…we became characters in a fantasy world. When we took the show to Ireland, only two of us were returning Oompas, so the process started all over again. What a thrill! 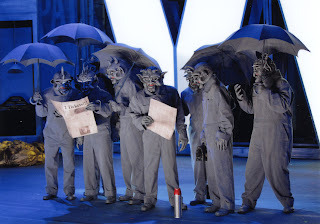 Each production of this opera became a new opportunity to find something different in this crazy world. And I’m very excited to see what the talented Atlanta Opera does with this wonderful show. For more information on how you can get your own “golden ticket” to this opera, check out the Atlanta Opera’s website. Wonderful interview with a very talented young man! I look forward to the Atlanta Opera's production of The Golden Ticket and also many more opportunities to hear Adam sing!